A celebration of the most important relationship in a straight girl’s life—her gay best friend. A share of the proceeds from this book will benefit The Trevor Project, a nonprofit organization dedicated to helping gay teens. 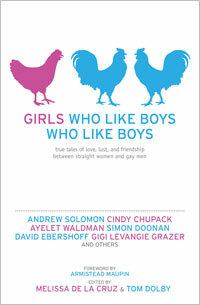 Melissa de la Cruz and Tom Dolby's book, "Girls Who Like Boys Who Like Boys," is coming to TV this summer. The Sundance Channel is producing a reality series inspired by the book's theme -- women and their gay best friends. The show, pitched as "The Real- life Will & Grace," is currently filming around Manhattan for a Winter premiere, but Sundance is keeping the cast a secret. Taken from the official Sundance Channel site: "GIRLS WHO LIKE BOYS WHO LIKE BOYS is a groundbreaking series that explores a special kind of relationship: a woman and her gay best friend. A bond that goes deeper than friendship, it’s a fresh perspective on love, companionship, and the meaning of “happily ever after” that is catching the attention of a wider community."